ANCESTORS OF THE MEDES AND PERSIANS? It seems that from about 900 BC to the mid 6th century BC, Iranian-speaking people were intermixing with existing populations in western Iran and the Zagros area. Neo-Assyrian texts refer to the Mannaean kingdom southwest of Lake Urmia - could they be connected with the huge archaeological site at Hasanlu, or even be an early outpost of Iranian migration? Hasanlu is an extensive archaeological site in northwest Iran (Azerbaijan) just south of Lake Urmia. It was occupied from the Neolithic period until around 800 BC - when it was comprehensively destroyed - probably by Urartu, though there is evidence that the people of Hasanlu had tried to maintain their independence from both their powerful neighbours, Assyria to the west and Urartu to the north. The city walls 9 metres high (similar height to today's "separation walls" between Israel and the occupied territories) suggest a focus on defence! The sack and burning of the city (Hasanlu IVB) entailed mass executions: the surviving evidence of bodies and accompanying artefacts has led to a comparison with Pompeii. Architecturally interesting is the presence of small columned halls, similar to later ones at Nush-i Jan, and Godin Tepe - and forerunners of those in Achaemenid palace complexes. After the destruction, Hasanlu became an Urartian fortress - and the site continued to be inhabited until around 300 BC. The Golden Bowl was found squashed, near the skeletal hand of one of three men who'd been trying to escape with it during the 9th century BC destruction - were they defenders or attackers? The bowl itself may be considerably older - but almost everything about it is controversial: for the discussion see here. It's been suggested that a "bearded man in a skirt" on the bowl is evidence of acceptance of transgendered people in this community - apparently also indicated by a cluster of burials containing both "male" and "female" artefacts see article in Haaretz (Dec 2018). The "Hasanlu lovers" - a couple buried together are probably two males, a younger and an older. see this video for a full discussion of all these questions! Who were the people of Hasanlu? We do not know. Were they non-Indo-european, possibly of Hurrian descent, and possibly related to the Urartians? Did they include an element of more recent Indo-European arrivals who amalgamated with the earlier inhabitants? Were they the Mannaeans mentioned in the Bible [Jeremiah 51.27] and Assyrian and Urartian texts? It seems that the Mannaean rulers, at least, spoke Hurrian - but that their subjects may have included a substantial number of Indo-European speaking Iranians. But it's not clear that the people of Urartu were Mannaeans! Their relationship with Assyria and Urartu is complicated - see here. 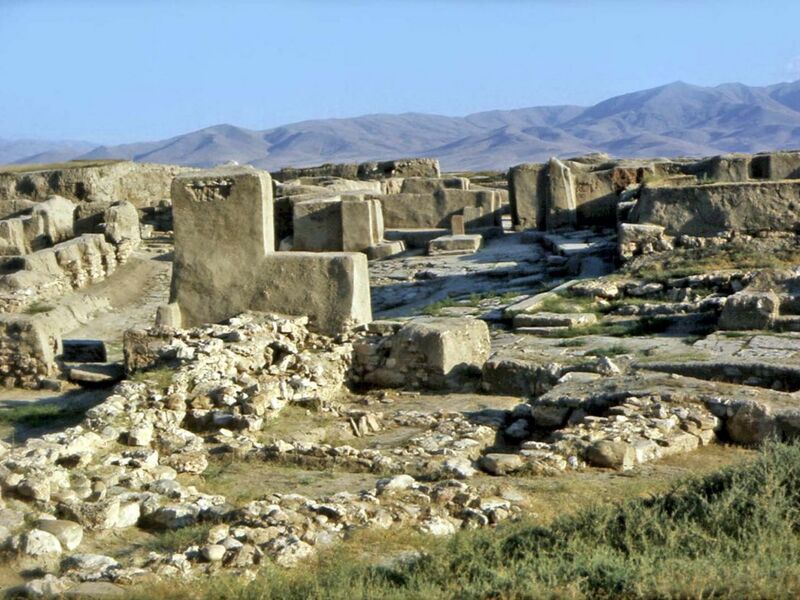 A mysterious archaeological site in Azerbaijan may be early evidence for an Iranian presence south of the Caucasus. A people identified by a distinctive culture and language (possibly an ancestor of the Urartian language) who flourished in western Anatolia and northern Mesopotamia between 2300 and 1000 BC. They were ruled by the Indo-Europeans speaking Mitanni for most of their history. They were eliminated by the Hittites from the west and Assyrians from the south. Hurrian inscriptions have been found in the Hittite capital, and show they were culturally influential there.